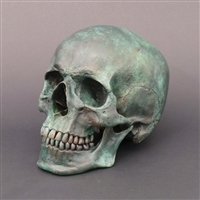 Full size Human Skull in Silvered Bronze. Full size Human Skull in Stainless Steel with an angry face. Each skull is sculpted by hand and are totally unique. 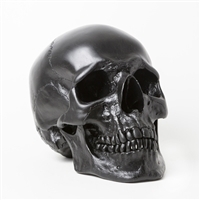 H 6.5" W 5.5" D 8"
Full size Human Skull in Stainless Steel with a sad expression. Each skull is sculpted by hand and totally unique.